Have you read the Civil Society Futures report which launched in November 2018? It shares findings from an independent inquiry looking at English civil society. It argued that civil society needs to change to be fit for the future. 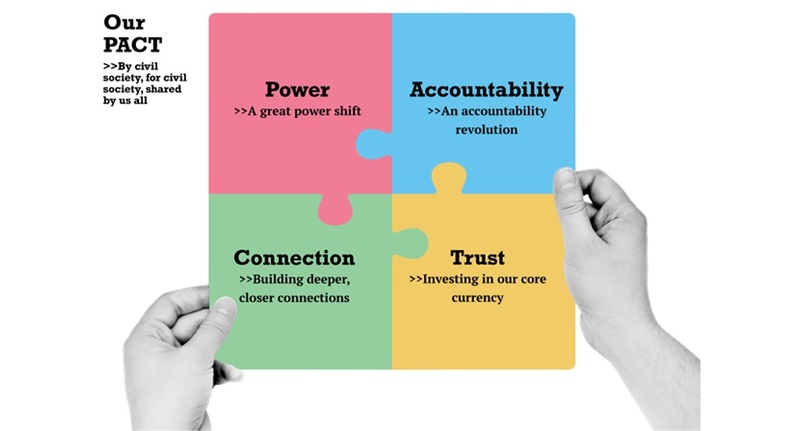 The inquiry sets out the changes it advocates using the acronym PACT > Power | Accountability | Connection | Trust. This is intended as shorthand for four aspirations for us all to commit to. The inquiry says: "Collectively, we have the power to change ourselves and shape our country and communities for the better. Let’s take responsibility for the future of civil society and society itself. PACT is something we can all put into practice in what we do as part of civil society. This change won’t come from outside – it is in our hands. It requires all of us to re-examine and renew our behaviours, attitudes and practices." Find out more about PACT. This guide explains what we can all do to put PACT into practice (PDF). Andrew Purkis recently wrote this looking at strengths and weaknesses in the report. We hosted an event (on 2 April 2019) to look at the findings and actions from the report and to explore its implications with Chairs. We heard contributions from our panel who were Steve Wyler from Civil Society Futures, Beryl Hobson and Ruth Ibegbuna. The following themes emerged. Steve Wyler said: "We looked at the evolution of civil society and what it looks like now. We found that there is a compelling role for civil society but there is a radical shift to put power in the hands of communities. This is about building positive change. Preventing an 'us' and 'them' future. Stopping doing things to people, instead, with people." This echoed discussions we have been hearing elsewhere including at the NCVO annual conference the day before. Many organisations are looking to involve a wider group of people in designing services and sharing power. This takes different forms. For example the board seeking more ethnic diversity. For others it’s having people with ‘lived experience’ on the board, or less emphasis on professional skills. Others are questioning the terminology of ‘beneficiaries’ as unhelpful. And it is not about tokenism. Ruth Ibeguna says: "Having one or two people on the board isn't enough to shift the power. If people are willing to give up a little bit of power, that's not it. How many boards are willing to give up their own power? We need to go back to our communities and invite them to join. We need their help. We need to do things differently." Are young people being included in this shift? Ruth shared her experience of working with young people who feel locked out of power structures. Increasingly they are also no longer joining things, so membership organisations struggle to connect with them. How can this be overcome? Yet young people do want to influence change. Look at the scale of global youth climate strikes for example. What is your organisation doing to find ways of including young people on their terms? How diverse is your board? Beryl asked: "Do you buck the trend found by recent Charity Commission research which showed that men outnumber women trustees on boards by two to one. The majority (92%) of trustees are white, older and above average income and education." Ruth said: "It is time to stop talking about diversity and do something about it. Recruit in a positive way. It is not enough to say that you can't find people with the right skills. Instead you need to be proactive, go out to the communities you want to recruit from and bring them in. For example if you are looking for a woman with digital experience, get in touch with organisations like Women in Technology." How can you broaden the diversity of thought on your board? It is not just about ticking boxes of race and gender but inviting people with different experiences and backgrounds. The board should be challenging, not comfortable, not just completing the business of the day. Having a board of like-minded people doesn't drive change. Think about when and how you are running meetings. Do your practices mean you will only recruit trustees who are retired and have time to meet during the day? Can you offer shadowing or mentoring to upskill people with lived experience to develop them as trustees? Are your trustees engaged? It's so much more than meeting four times a year. Do your trustees (and you) really know the people you serve? Can you describe them? Have you met them? Do you know what they think of your charity's work? How are you involving them, what power are you giving them to take decisions? 92 ideas you can do to put the PACT in to practice. Why all trustee boards could benefit from an Expert Citizen - Darren Murrinas' experience of joining Lankelly Chase's board as a person with lived experience. While you are here.... We are looking for new trustees. Could it be you or someone you know? Please help to spread the word. Thanks!